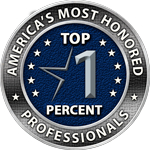 Seattle personal injury attorney and founder of Davis Law Group, Christopher M. Davis, has been recognized by American Registry as among the top 1% of America’s Most Honored Professionals. This award pays tribute to business people who rise to the top of America's most highly recognized professionals. Honorees were carefully selected from American Registry's comprehensive database of publicly acknowledged professionals. Qualification criteria include repeated, authenticated, publicized honors from the press, peers, trade groups and clients over a five year period. American Registry is in a unique position to qualify top professionals across industries as its researchers specialize in authenticating the legitimacy and value of professional and business recognitions.